It's been three years since Kristin Hannah's previous novel, The Nightingale, came out. Three long years of waiting to see what she'd come up with next. I can assure you that The Great Alone was definitely worth the wait. I have one word for it: Epic. I really didn't know what to expect from this novel. 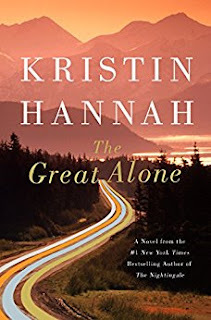 Truth be told, the concept of homesteading in Alaska was not what drew me to it as much as Kristin Hannah being the writer and the fact that a teenage girl was the narrator. However, I learned a lot of new things, including what an ulu is. (There's this funny video online that mentions it and I had no idea what they meant until now.) Even though I've never been to Alaska, it was easy to visualize through Kristin's writing. I can't imagine being in Leni's shoes (or Cora's for that matter), but I got some understanding about what Alaska really meant to them. Overall, The Great Alone is an incredibly powerful story that I can't stop thinking about or recommending. Thanks to St. Martin's Press for the book in exchange for an honest review. They have TWO copies to give away! I am still in the process of reading this one but I'm loving it so far. Your casting is always spot on so now all the characters will replaced by your cast. :) Thanks for the great review! When I was 10 years old, we moved from New York to Texas. At the time, I thought Texas was another country since it seemed so far away. I moved across country after college but then I moved back home after a year. I guess since coming from a large family I missed my family. If I had not moved back I probably would not have met my husband. My favorite novel by Kristin Hannah is Night Garden. Memorable and unforgettable. We moved 2000 miles away from my home in 1995. I am a big fan Of Kristin's. Can't wait to read this one. I have not read any of Kristin's books but this sounds a great read. My biggest more was to shift off farm and into town when we retired. I live in New Zealand and the move was only to a town 20 km from the farm but it was a big adjustment, but gives me more time for reading!!!!!!! I just finished this book. I literally inhaled it because I had the Audiobook and print version. I loved the characters and the struggles and the location. 5 stars in my opinion!! I think your cast would be perfect!! I've never left California, but my family have moved from Northern California to Southern California and back to Northern California after two years and have stayed here since. I actually haven't read any, but this looks like a great place to start! I lived in Nantes, France for a year during university! As a child, I moved across country, from California to New Jersey, at age 5. And I moved back to California at age 11. As an adult, I moved from L.A. to San Diego. My favorite Kristin Hannah book is Firefly Lane. I have moved across country - FAR!!!! I’m a long time Kristin Hannah fan from many years ago. I’m so excited for her success. Well deserved. In the past I have bought her books when I’ve gone to her signing events at my local store but she isn’t coming this year so I’m hoping to win a copy!!! My favorite of hers has to be the first one I read, The Magic Hour. So far, my favorite Kristin Hannah book is Winter Garden, but I love every one I have read. I can't wait to read this one! I love Kristin Hannah! The Nightingale is my favorite and I can’t wait to read this one! My favorite of hers (so far) is The Nightingale. We moved 8 hours away. Luckily we were able to move back 4 months later. I've read several of Kristin Hannah's books, and enjoyed them all, but my favorite is The Nightingale. My favorite Kristin Hannah book is Between Sisters. I haven't read any of her books yet. I've heard great things. My mom has read her books. She really likes her writing.